"Results-Based Leadership makes one of the most important statements about the very meaning and importance of leadership." Effective leadership = leadership attributes × results. What is missing in most leadership-related writings and teachings, is the lack of attention to results. Most of them focus on organizational capabilities – such as adaptability, agility, mission-directed, or values-based – or on leadership competencies – such as vision, character, trust, and other exemplary attributes, competencies and capabilities. All well and good, but what is seriously missing is the connection between these critical capabilities and results. 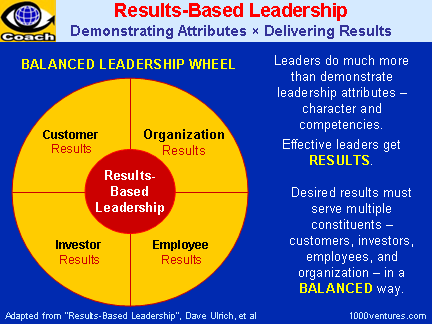 And this is what results-based leadership is all about: how organizational capabilities and leadership competencies lead to and are connected to desired results. By helping leaders at all levels get results, results-based leadership frees productivity from constraints of hierarchy and the limitations of position. Results-based leaders define results by understanding audience and customer needs. They continually ask and answer the question – "What is wanted?" – before they decided how to meet these needs. Employees willingly follow result-based leaders who know both who they are (their own leadership attributes) and where they are going (their targeted results). Such leaders instill confidence and inspire trust in others because they are direct, focused, and consistent.